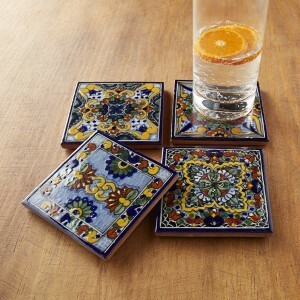 Today’s “True” Talavera tile and pottery is hand-formed from the rich black and white volcanic soils in and around Puebla, Mexico, where tradition and technique define this vivid craft. But Mexico hasn’t always been Talavera’s home. The history of Talavera spans centuries, cultures and continents. The Church of Santo Domingo. In the 15th and 16th centuries, the central Iberian town of Talavera de la Reina became so internationally renowned for its ceramics that it was called “La Ciudad de la Cerámica,” or the “The City of Ceramics.” The city’s designs owe a lot to the international population that resided there, including Dutch and Arab settlers that contributed new techniques, tools and tastes that ultimately informed the Talavera style. When the city of Puebla, Mexico was established in 1531—just a decade after the conquest of the Aztec Empire—the production of ceramic goods came naturally to its people, thanks to the abundance of quality clay and a long tradition of producing earthenware. The prehispanic cultures of Mexico did not, however, use a potter’s wheel and were unfamiliar with tin-glazing. Both of these were introduced to them by Spaniards in the 16th century, transforming their methods of making, painting and glazing pottery with Talavera’s now trademark milky white glaze. The people of Puebla inherited their knowledge of the Talavera technique during construction of the Church of Santo Domingo, which began in 1571. According to many accounts, the Spanish monks called for craftsmen to cross the Atlantic Ocean from Talavera de la Reina so that their monastery and church could be decorated in the way they were accustomed—with hand-painted tiles and religious figures. (The Santo Domingo was completed in 1611 and remains one of the most impressively ornate interiors in the world and a superb example of Mexican baroque.) Others say the Dominican friars themselves knew how to produce these tiles and taught locals. We don’t precisely know how or why the Spanish craftsmen arrived in Puebla, but documents have verified their presence in the region. And they flourished there during the 16th century, establishing their workshops at a time when many churches and monasteries were being erected and their facades decorated with tile. Very much worthy of a visit, the Puebla region is now a beautiful riot of colonial era buildings covered in Talavera tiles. When the Puebla craftspeople incorporated the art forms and colors they loved with the new techniques they’d learned from Spanish settlers, Mexican Talavera emerged. 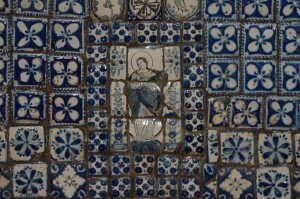 Typical of early Talavera, blue was highly prized. Talavera is sometimes encompassed in the broader term, “Mexican maiolica,” referring to the Italian tin-glazing pottery technique that was introduced in the 14th century. Originally, the color spoke explicitly to its quality. As blue pigments were much more expensive, ceramics featuring the color blue were easily differentiated as being of the highest quality in the 16th and 17th centuries. During the 18th century, it became more common to use green, mauve and yellow along with blues – all sourced from natural pigments, as they still are today in the authentic workshops. And it wasn’t just the color of Talavera that was found to be important, but also the volume. The number of Talavera tiles on the facade of a building was equated with the prosperity of a family or a business; hence, the saying “to never be able to build a house with tiles” fell into use. In other words, if you aren’t able to build a house with tiles (azulejos), you haven’t amounted to anything in life. Talavera pottery remains important to the Toledo province of Spain in which Talavera de la Reina is located, but those who are considered the authentic artisans reside exclusively in Mexico’s Puebla region. There, they employ precisely the same techniques that were used in the 16th century and collect their clay only from designated areas. The term “Talavera” has been commonly adopted by another ceramics-producing region in the Mexican state of Guanajuato, and this is what can get confusing. Pretty, yet quickly produced, it has little to do with the highly detailed, rigorously defined process that is required from authenticity, a process that is followed only in the Puebla area of Mexico and even requires the use of very specific volcanic soils found only in that geographical region. Other key differences include using commercial colors rather than the natural pigments used in authentic Talavera, and tile designs are more commonly stamped on the lesser quality tiles, rather than meticulously hand painted. Not all Talavera tile is created equal and consumers should be aware that much of what is called “Talavera” or “Talavera style” is an entirely different level of craftsmanship from true Talavera tile with its dedication to historical legacy and extremely high standards. Though it can now call Mexico home, the style will always represent a melting pot of cultures—from Arabic to Italian, Spanish to Chinese, and of course Mexican. It’s also an important part of the Native Trails’ product line—as it has been since the founding years in the late 1990’s. In Talavera, we see many of our company values: a commitment to the earth, to our artisans and the joy of their craft, and to traditions which unite and thrill us. We are proud to continue the celebration of this ancient art form.